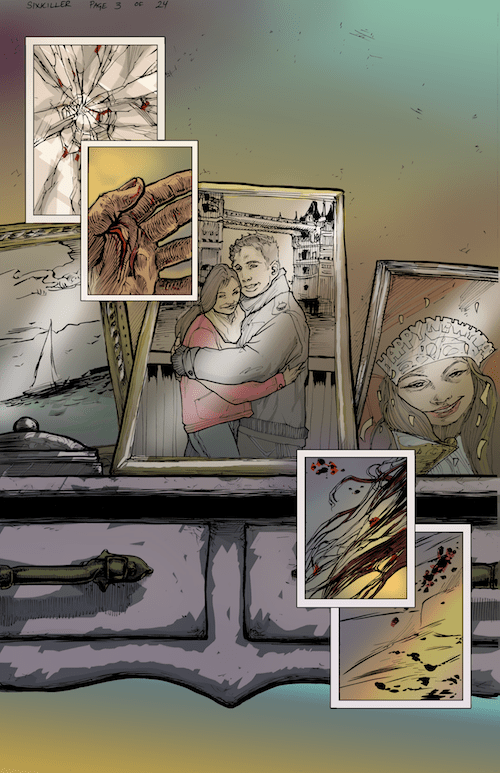 The publisher, retailer and convention organizer talks about writing his first comic. Lee Francis IV has been the CEO and founder of Native Reality Press for many years now, publishing books like Tales of the Mighty Code Talkers and Deer Woman, and comics like Tribal Force and Hero Twins. While Francis is a writer, it’s not until now that he sat down to write a comic. The first issue of Sixkiller has just been released. Written by Francis and drawn by Weshoyot Alvitre, the book is a mixture of influences, both pop culture and real life issues. I reached out to Francis to talk about the story and why he needed to write this story. How do you describe Sixkiller? It’s Alice in Wonderland meets Kill Bill set in Cherokee Country. Basically it’s about a young woman, Alice Sixkiller, seeking revenge for the murder of her sister. She also has schizophrenia and other issues which blend in with her heritage, which is Cherokee. It has a lot to do with the Osage murders and how that plays out around revenge and history and blood memory. You’ve been publishing comics for years but this is the first comic you’ve written. How did it start? I wanted to do something around the indigenization of Western stories in the canon. What can we adapt in terms of an indigenous framework. I had started to think about how Alice in Wonderland blends over into some of these traditional stories. I started talking with Roy Boney Jr. about doing something because there are some great parallels with Cherokee characters. The rabbit is a trickster for example. We were trying to find all of these analogues and some of them are spoilers. How we could cross over with the work and tell a unique story. Shortly after I started to think about that, the Violence Against Women Act was passed. It didn’t include protections for Native women initially. I was really upset. These are our mothers, our sisters, our friends, our daughters. I wanted to write to that. I thought we could take this Cherokee-Alice story idea and put a spin on it where I can address the issue and talk about violence against Native women while simultaneously containing it within an interesting story. That was a couple years ago and working with Weshoyot Alvitre on this has been amazing dynamic. Originally I was working with Roy Boney but then he got a great position within the Cherokee Nation and so his time became very limited. He’s continued to serve as a consultant on the book, but it was great to have a women illustrator involved in the work. What about her work lends itself to this story and what has she been able to do? Because her style is very intricate and very detailed, it lends that intricacy within the work. She has such a great sense of framing and placement and the dynamic aspects of the storytelling that come through visually. In some ways it’s less work that I have to do to communicate what I want because I know she’ll show it in the art. We had several conversations leading into this and I got to see the thumbnails, but she has such a keen understanding of comics. She’s worked in the industry. Her mentors are some of the heavyweights. Her art in an of itself is just stellar. She lends that aspect of how to bring an aesthetic around women that allows for the story to unfold visually in a way that I don’t, and can’t necessarily because I’m not a woman. It’s been an incredible partnership. I’m forever indebted to her for her work. I’m sure you were both very conscious of and concerned about how you handled violence. Because this is a real lie issue and you want to address it in a serious way that doesn’t cheapen it. She and I went back and forth on that. Trying to avoid tropes like the “girl in the refrigerator” was very much in my mind. Choosing the violence against native women as a trigger point is necessary when we’re launching a story, but not objectifying it, not normalizing it, not belittling it I think is really important. Not normalizing the images associated with it was really important. We went back and forth about how that was going to work and I really wanted to check in with her about how she was approaching this and her feelings towards it. Early on she was like, let me read the script. She read it and her take was, I trust that you’re not trying to use violence perpetrated against native women as a hero maker. We were very thoughtful and very careful about how we were portraying it. You mentioned that there are analogues to Cherokee mythology in Alice in Wonderland. 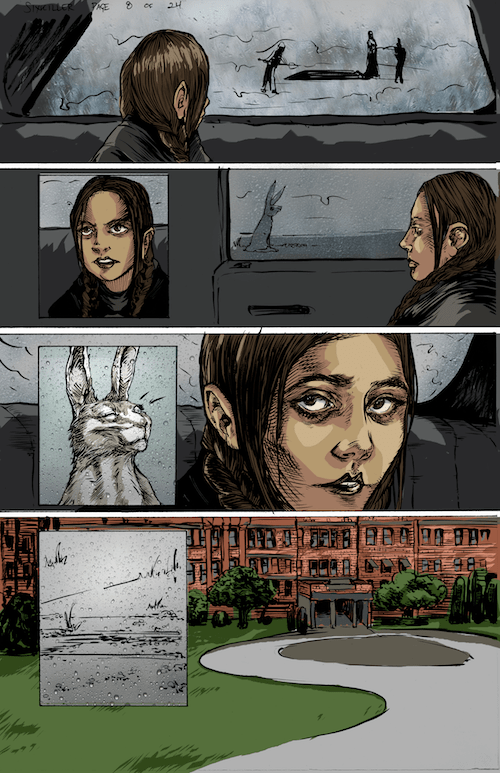 Alice is a complicated narrative with a lot of wordplay, how do you start with that? Alice is much more playful. In my mind it’s basically leaving little Alice breadcrumbs. If you know the Alice story you’ll get what we’re presenting as it follows sort of the same –and I use this in the loosest way – linear path through Alice in Wonderland. It follows the general structure, but there are a lot of divergent points because we’re focusing on a different type of narrative. It’s a revenge story. That’s where the Kill Bill part comes in. There is a Point A and a Point B and you’re following her going from Point A, saying I’m going to get revenge, to Point B, which is the revenge and the aftermath. From the scriptural standpoint there are quotes and ways I’m weaving in language that Lewis Carroll used into the narrative itself where if people know the story they’ll go, wait a minute. It’s partly an homage but also gives our narrative structure and helps drive the action. In Alice there’s a lot of nonsense language, but I kept thinking about the suppression of Native languages and if you try to incorporate Cherokee or other languages into the narrative? A little bit. I use the Native language without explaining it. I do translations very rarely. If it was an educational book that’s great, but for the most part I tend to put stuff in there and you don’t have to know and I don’t care if you know it. The visuals provide the context and the clue. I’m not going to translate or pull lines out that are critical for you to understand what’s happening in the action. I have two or three lines of Cherokee, so not too many. Either you know it or you don’t, and that’s okay. That’s part of that language play and it does harken back to the Alice. Lewis Carroll wasn’t telling you what X, Y and Z means anymore than Dr Seuss did. He portrayed whosits and whatsits and all that visually. It was there, it was part of the visuals, and you just accepted it and moved on. That’s where we’re coming at it, too. There’s not much in the first issue, but as the story goes on and it gets deeper and more into this cultural context some of those things will become much more evident. So this is the first issue. How big is the story? This particular story will be 6-8 issues. It could potentially be more. It will depend on me and Weshoyot, but I was imagining between a six and eight issue story arc. What else is coming out from Native Realities soon? We’re hoping to put the wrap on Tribal Force #2 so the issue will finally be out soon. 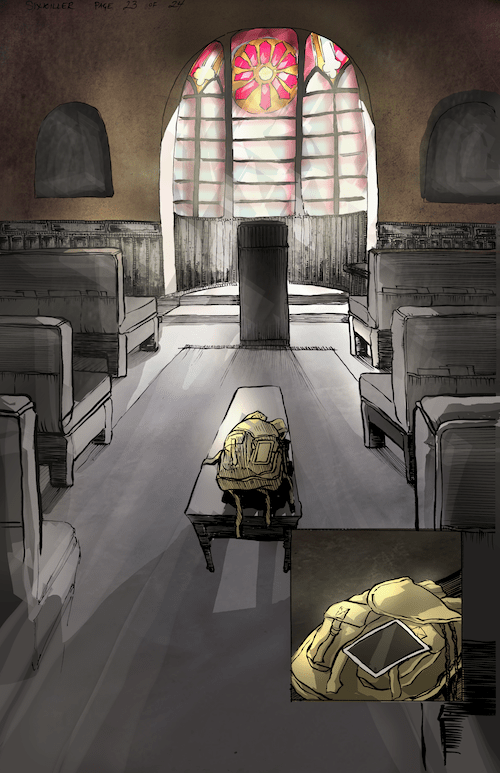 We’re finishing the colors now. That will be really exciting. Hero Twins #2 will be coming out in the next couple of months. Dale is working on the illustrations right now. Our second anthology will be coming out soon. Then there’s a couple of other things that are in the works that we don’t have a final timeline on, but hopefully we’ll be coming out with one or two more issues before the end of the year. 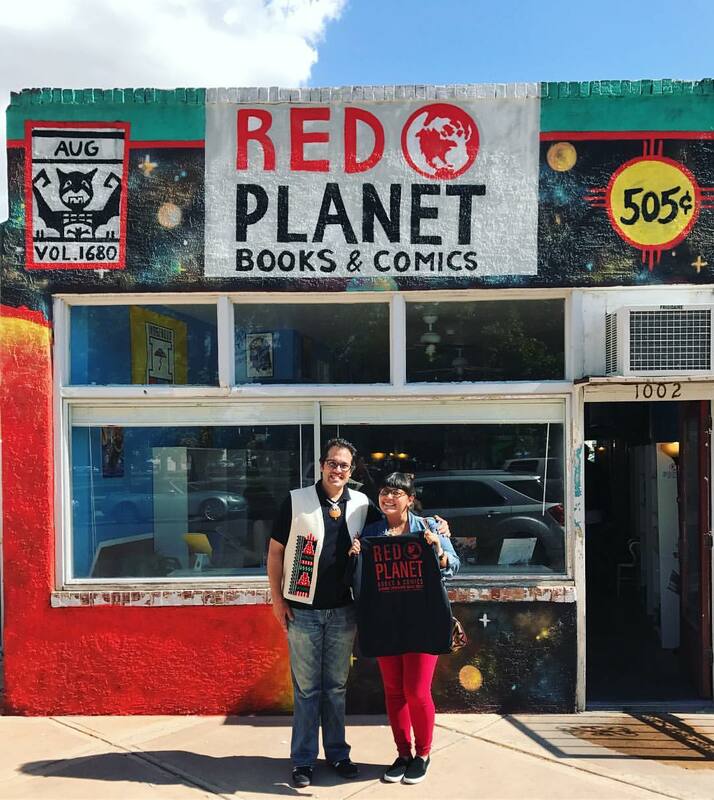 Rebecca Roanhorse won a Nebula Award recently and now her first novel is just out, and what she does and what Sixkiller does and what other Native creators have been doing is making something pop culture and familiar, but also done in a way that’s new and dynamic and culturally specific. Exactly. What Rebecca has done and what we do whenever we get to tell pop culture genre work is that we approach it as indigenous-centric stories. We’re not telling the story of a Native person and a non-native person. No. We want to tell the stories of home but we’re going to set it in the future. Or we’re telling our stories from our home places but in a different way, like through the tale of Alice. Some of them are gritty, some of them are scary, some of them are fun, some of them are futuristic. What we’re seeing is us building on the shoulders of those amazing literary Native folks that came before us to expand the canon. So what’s your final pitch for the book? The story is interesting. It’s a bit of a head trip. It plays around with expectations. If you like incredible art. 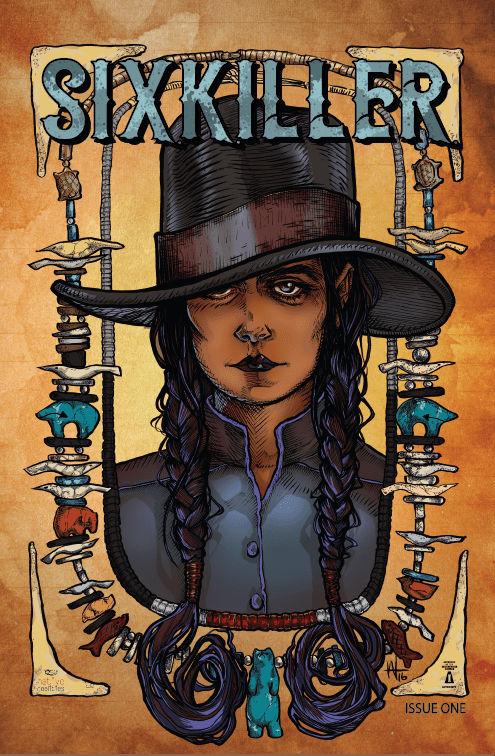 If you want a Native-centric story that doesn’t conform to the tropes and trappings of that. It’s a modern story. It’s about struggle. It’s about heartbreak. It’s about resilience. It’s about resistance. It’s about revenge. Those are all human traditions that make these kinds of stories compelling. Plus, I wrote it! So there’s that, too!